OMG and Hallelujah, let the trumpets resound the joy of knowing that FEBRUARY IS OVER!!!!!!!!! Whew, I’m glad I got that off my chest – it’s been bugging me ever since the Super Bowl ended! Alrighty then, it’s time to talk shop. 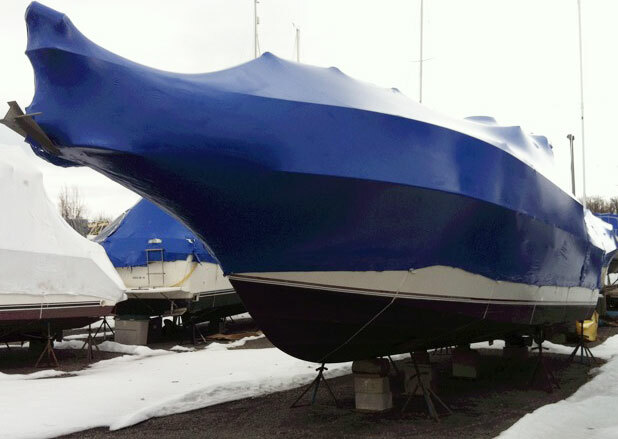 The boats have been sitting on the yard for sometime now and depending on where you’re from will determine the chill factor that your gelcoat has assumed. My poor boat is muttering profanities at any rumor of global warming – poor girl has been looking at hard water – as in frozen – long enough, and she longs to have her finely tailored blue zoot suit (aka shrink wrap) removed. She wants to take a deep breath of fresh spring air. I reckon she feels like the Tin Man when he squeaked for a shot of penetrating oil. And when the day comes and the air is filled with the hum of buffing wheels and seeing dock buddies yelling “Hey man, how’s your winter been?” and of course the “pssst!” sound of a freshly cracked cold-one, we boaters know it’s finally boating season 2013!! YAY!!! Do you have any projects planned to spruce up your boat this season? This year I’ve arranged to have available a few of my associates who are very savvy at various aspects of boat improvement. There’s a paint & gelcoat specialist, a canvas and upholstery tradesman, and a marine electronics specialist, too. So, don’t hesitate to contact us with your questions. I’ll share the application technique of this dynamic duo in Part II of this blog post, and it will also be available on www.boatbrite.com at that time. Don't worry, it won't be long. But for now, the stage is yours. We’re standing by to help you get your boat outfitted, looking her best and ready to splash. All inquiries will be answered by either myself or by one of the professionals mentioned above in a very timely manner. So, give us a call toll-free at 1-877-BOAT-BRI, or send your questions through our contact page, and we’ll email or call you back.